The race is on to sign-up for the first-ever XTERA Asia-Pacific Championship race with entries being accepted online starting Wednesday, November 6, at www.xterraasiapacific.com. Special early bird rates apply through November 30, 2013, and team entries (2-3 persons) are also available in the full and sprint distance races. November 6, 2013 (Honolulu, HI) – The race is on to sign-up for the first-ever XTERRA Asia-Pacific Championship race with entries being accepted online starting Wednesday, November 6, at www.xterraasiapacific.com. Special early bird rates apply through November 30, 2013, and team entries (2-3 persons) are also available in the full and sprint distance races. The inaugural event is scheduled for April 27, 2014 at Callala Bay, a small town on the South Coast of New South Wales, Australia. 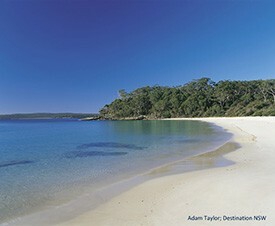 It is situated on the north shore of Jervis Bay, roughly 2 to 2-1/2 hours drive from Sydney or Canberra. Callala is renowned for its mountain biking, white sand beaches and clear turquoise water. The area boasts several national parks and is teeming with native wildlife as well as whales, dolphins and an amazing array of ocean life. The main event will combine a one-mile swim with roughly 30-kilometers of mountain biking followed by 10km of trail running. The XTERRA Asia-Pacific Championship race will double as the XTERRA Australia Championship, awarding national titles to locals and qualifying spots into the XTERRA World Championship for all involved. The April 26-27 weekend will also include a sprint distance off-road triathlon (half-mile swim, 15K mountain bike, 5K trail run), plus stand-alone trail runs, ocean swims, kid’s races, camps, clinics, and social gatherings. Learn more and register at www.xterraasiapacific.com. For more information on the XTERRA brand and worldwide event series, visit www.xterraplanet.com Athlete inquiries may be directed to info@xterraplanet.com.